If lying on a beach is not your thing and you yearn for a bit of adventure set against an exotic backdrop, have you thought about the possibilities the vast sub-content of India has to offer? The country offers a wealth of ancient temples and monuments for lovers of culture and heritage and many travel companies now offer fantastic sight-seeing trips. 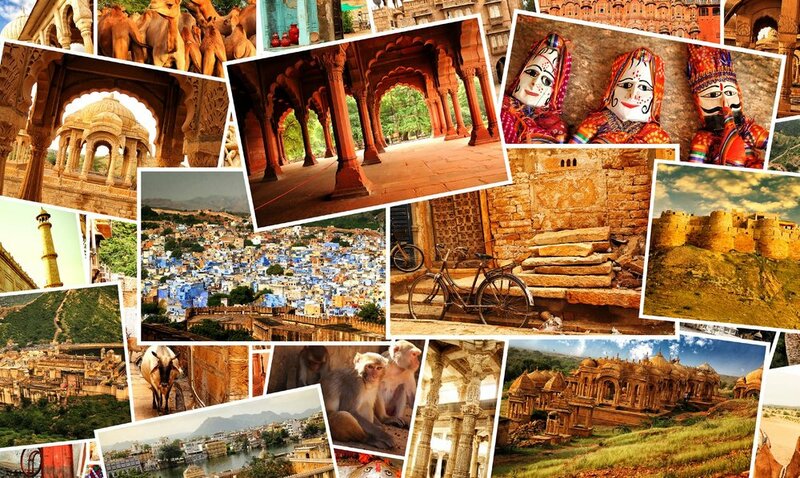 For example, a Golden Triangle Tour traces the rugged landscape of northern India. You’ll begin in Delhi where you will find the best food and markets, along with stunning monuments. Then you’ll taste the spirit of adventure at the Sariska Tiger Reserve! As the landscape unfolds the magical city of red sandstone, the excitement flows to Jaipur, the pink city. Then you may just spot a tiger at Ranthambore National Park and later experience the romance and magic of the Taj Mahal. In southern India, you’ll witness magically carved temples, walk through markets dazzling with silks and sandalwood items and open your eyes to a landscape embroidered with banana leaf, paddy fields and coconut groves. This may not be a land of forts and palaces, but it is dominated by temples and natural beauty. Whether you travel to Chennai, Bangalore or Mysore, or choose to explore the beautiful port city of Cochin or the wild Periyar Tiger Reserve in Thekkady, you can fill your visit with memorable events such as an elephant ride, a traditional kathakali dance performance or an enchanting boat cruise along the rustic canals and lagoons in the city of Alleppey. The Great Indian Desert may not have great expanses of sand dunes and incredible spaces of wilderness as large as those of the Sahara and Namibia, but it offers some glorious citadels and extremely colorful and unspoiled villages. The Camel Safari Circuit in India covers Jaisalmer, Jodhpur and Bikaner, all located in the northeastern state of Rajasthan. They were the princely kingdoms in the desert belt of India, each comparable in size to many modern nations of Europe. All the former capitals prospered from trade with the camel caravans that travelled from west Asia and Europe to Mongolia and were impressively fortified to protect these riches. The result was a wealth of palaces and havelis (traditional mansions) built for royalty, courtyard mansions built for merchants and nobility and intricately carved temples erected for the region’s subjects. Desert camel safaris in India are now one of Asia’s fastest selling adventure vacations. A camel safari is a great way to visit vibrant villages and see exotic wildlife while riding across open desert sands. Camel treks range from short rides around Jaisalmer to extensive trips that remind you of scenes from Lawrence of Arabia. Typical camel safaris organized around Jaisalmer take in the architectural ruins of Lodurva, which was the former capital of the Bhatti Rajput desert kingdom before the founding of Jaisalmer, the Anasagar oasis, the sand dunes of Samm and the water source of Moolsagar, where village women gather with pitchers at dusk. Night stops on basic safaris are at villages or temporary bivouac camps in the desert scrub, where camels are hobbled and let out to graze. Packing the right clothing is important on one of these vacations as the climate is extreme. In the desert afternoons may seem much hotter than the actual 80-degree temperature may suggest and night temperatures may drop below freezing on the dunes. It is essential to take both woolen and cotton clothing. Shorts and skirts are comfortable for camel safaris, but remember some of the offbeat routes visit villages that have not have seen many tourists and locals may look askance at men in shorts and ladies who do not wear ankle length clothing. Sun hats with large rims or cotton caps that can be dipped in water when it gets too hot around midday are essential, preferably with a balaclava or scarf for covering the neck and forehead. If you’re prone to motion sickness, you should carry suitable medication against the swaying gait of the camel. Finally, patience is an important piece of baggage on a camel safari as it takes time to get used to travelling by camel. There’s a huge variety of other special interests that can be catered for in India, including angling and fishing, gliding, mountaineering and rock climbing, skiing and winter sports plus white water rafting and, of course, elephant safaris. Trout fishing in the rivers and ice-fed mountain streams is a great sport. You may pit your wits against the wily trout (both brown and rainbow) while those who enjoy solitude can spend hours in quiet contemplation of the natural beauty. The fast-flowing, clear water streams and high-altitude lakes of the upper Himalayas are excellent for trout fishing. The challenge and thrill of an encounter with the powerful mahseer—the hardest fighting fish on the planet that rules the Indian waters like the tiger does the jungle—attracts anglers from all over the world. These are exciting times for India’s LGBTQ community! In 2006, Prince Manvendra Singh Gohil came out making him the country’s first openly gay prince. Since then, he has fought for LGBTQ rights in India by forming a grassroots campaign called “Free Gay India” and taking his fight to America by making guest appearances on The Oprah Winfrey Show and Keeping Up with the Kardashians. In the summer of 2017, India’s Supreme Court declared that an individual’s sexual orientation is a fundamental right protected under the country’s Right to Privacy law. Now is a great time to visit the subcontinent as an LGBTQ traveler! Once a bastion of homophobia, the entire nation is slowly beginning to embrace the LGBTQ community. Tour guides, hospitality industry professionals and locals value the lucrative international tourism industry and do not discriminate against anyone. Mumbai, Delhi, Bangalore and Jaipur are extremely gay-friendly cities, as are the states of Kerala and Goa. If you’re looking for gay Indian nightlife at its best, check out one of these exciting places! Once considered the jewel in the crown of the British Empire, India is now a robust democracy that offers cultural treasures, exotic escapes and natural beauty unlike anywhere else on earth. For your next international escapade, skip the European continent and take the time to explore the vast riches of the Indian subcontinent!